The government’s opinion is that problems must be solved by discussing with all parties. The Parliamentary Select Committee was formed because of this. 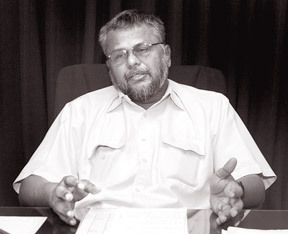 The reason that the TNA is still waiting to decide whether or not to participate in the PSC is for their political survival, not due to any other reason, said Traditional Industries and Small Enterprises Development Minister and EPDP General Secretary Douglas Devananda during an interview to the Daily News. The decision of the government will be the one taken by the PSC, not a decision reached at negotiations between the TNA, he said. Q: What is your vision for the future of the country? A: In the future we hope that people’s livelihoods and individual incomes will increase substantially. People will be able to live happily in society. Tomorrow should be better than today. We want to see more progress. Within the short period after the war, so much progress has taken place. In 10 or 20 years time, the situation will have improved significantly. Q: Is the government moving in the right direction towards achieving your vision? A: We believe that this government led by President Mahinda Rajapaksa is moving on the correct path. Likewise, if some kind of mistake or error is seen, we have the opportunity to correct those mistakes and move forward. The economic situation in the rest of the world has deteriorated. Some countries are doing very badly. But the situation in Sri Lanka is different. Our economy is still growing, still progressing. That is because of the strong and decisive leadership of the President. The President's leadership is the main reason for our success. Q: You represent mainly the people in the Northern Province. What do you see as the immediate needs of the people in the North? A: One of the main issues is livelihoods and income generating activities. But daily, even that is improving. Secondly, the political problems of the Tamil people, their political rights. Q: What are the political problems of the Tamil people? A: Are you asking to learn or because you don't know? Q: There are some people who don't believe that there is a political problem faced by the Tamil people, or they don't know the problems faced by the Tamil people. What do you say to them? A: All parties have acknowledged that there are issues with regard to the political rights of the Tamil people. Although it is not a burning issue at the moment, the problem does exist. Even the JVP now acknowledges there are political problems faced by the Tamil people. Not just in Sri Lanka, but even internationally, it is accepted that there is a political problem. There is a belief that there is a need to solve that problem. A: For example, the language problem. The law that both languages will be given equal prominence especially in the North and East. Even today that problem exists. (Tamil people still get official letters only in Sinhala and face difficulty receiving government services for example with the Police, in courts and in many other situations). Not being able to use their mother tongue in their own country is degrading. The inability of the Tamil people or stifling the rights of the Tamil people to solve their issues in accordance with their cultural practices is another issue. The devolution of power proposal was to solve the issues of the Tamil people. The Provincial Council system is still not working in the North, but it is implemented in the South. There are many problems like this. Q: Is there a communication gap where the people in the South do not know much about the day to day issues and difficulties faced by Tamil people in the North? A: Firstly it is a case of ignorance. Secondly it is a problem of knowing and pretending to not know. There is a saying that you can wake up the sleeping person, but you can't wake up the person pretending to be a sleep. Q: Politicians of the South don’t often talk about the problems faced by the Northern people. What do you say to that? A: I don't believe that is the situation today. Progressive forces in the South like Minister Vasudeva Nanayakkara and the Left political movement are speaking of these problems. Q: Is there a need to go from village to village and take the political solution to the people at the grass roots level such as the ‘Sudu Nelum’ movement in the 1990s? A: If politicians realize the situation that would be useful. But the situation those days is different from the situation now. Q: The EPDP has suggested the merger of the North and East as part of the political solution. How do you feel about the merger? A: Our opinion is that we must first protect what we have and implement the law that already exists. Then we should go forward from there. We have always and will always continue to talk about what can be achieved practically. We don't speak merely to gain political mileage. Q: The government has been negotiating directly with the TNA since early this year. Do you think it's fair to leave other stakeholders like the representatives of the Muslim community, political parties out of these negotiations? A: The government’s opinion is that problems must be solved by discussing with all parties. The government decided to form a Parliamentary Select Committee because of this. The reason that the TNA is still waiting to decide whether or not to participate in the PSC is just for their political survival, not for any other reason. The decision of the government will be the one taken by the PSC, not a decision reached at negotiations between the TNA. Q: What do you think of the TNA tactics of walking out of negotiations with the government once and now refusing to name their representatives for the PSC unless their conditions are met? A: The TNA's aim is not to solve problems. Their political survival is dependent on the existence of problems as unresolved issues. They don't want the problems to be solved. Q: You did very well in the coastal areas of Jaffna during the recently concluded Local Government election. Why do you think you didn't do so well in other parts of the Northern Province? A: Tamil people were used to anti-government politics for a long time. Since we are supporting the government, there is an issue. The general public, especially in the North, is still not clear of our stance. Once it becomes clearer, the situation will change. Also until 2009 we didn't have access to certain areas in the North because of the LTTE. But now that problem is not there. There are changes among the people. We did well in the past election but we will do even better in the future. We have brought the people a long way. We will lead the people forward in the right path. The other factor was the TNA campaign. They campaigned in a very racist manner during the elections. For example, the government was repairing the statue of the last king of Jaffna. The TNA spread rumours that the government had removed the statue and replacing it with a statue of The Buddha. Q: What is the feedback you get from the Northern people at present? A: The TNA are not working for the people. They only come to the village during election time. We are living with the people and working for their benefit. The pulse of the people is very important, not just in the media but also in politics. We have to think about that. The situation a few moths ago and now is different. The people's trust of the TNA is reducing day by day. Q: How will you win the support of the people who didn't support you at future elections? A: We have a plan to develop the areas that we won. It will show the people in other areas that we can deliver development and results. But even in areas where we didn't gain control, we have representatives there. We still have responsibilities in those areas and we will fulfill those responsibilities. Also in the past, people didn't want to come forward to contest elections with the EPDP because of the LTTE threat. This situation is improving. Now we will have very strong candidates to contest elections in the future. Q: If one of your friends or family members is accused of some illegal activity, will you do anything to help them? You can ask the Jaffna Police about my attitude. I have told them that if anyone misuses my name, take action. They tell me that in the South the politicians excuse wrongdoers but in Jaffna people are held to account. Q: Will you support the President to fully implement the recommendations of the Lessons Learnt and Reconciliation Commission (LLRC)? A: I will fully support the government to implement the LLRC recommendations. Q: There have been rumours that prominent members of the government are requesting Indian assistance to provide a safe haven for their paramilitary members? A: I have not heard of any such accusations against me. Let me just clarify, there is no need for anyone to be sent overseas. Now even the LTTE cadres are rehabilitated and pardoned. There is no need for anyone to go to India.